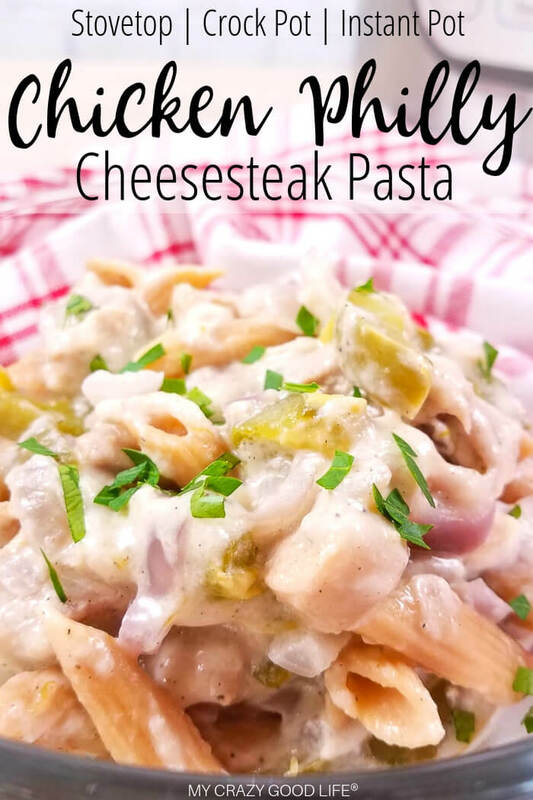 This healthy Chicken Philly Cheesesteak Pasta recipe is a delicious Instant Pot recipe that can also be made in the Crock Pot or on the stove! 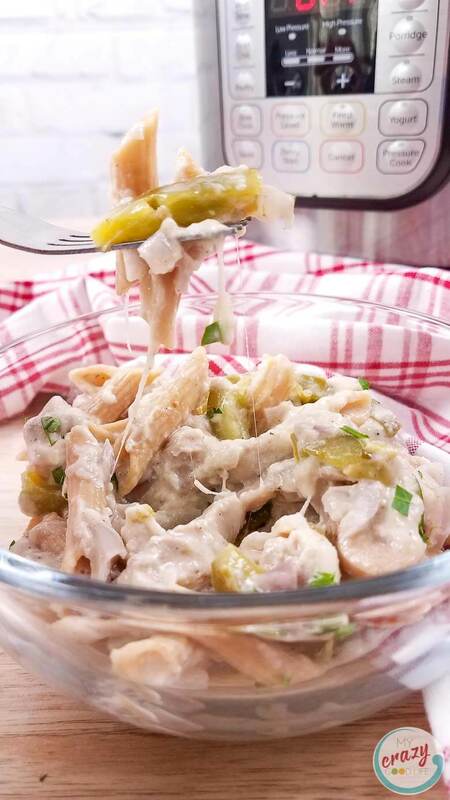 Cheesy pasta with chicken and peppers–this simple but delicious recipe is healthy and family friendly. 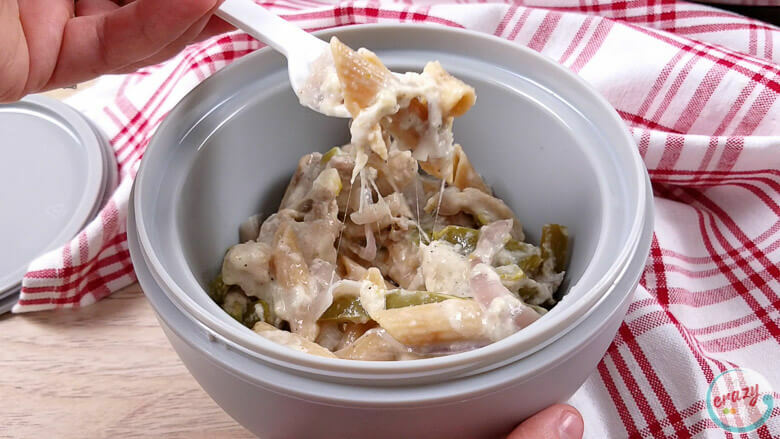 This Philly Cheese steak Pasta recipe is loaded with deliciousness–whole wheat pasta, creamy cheese, and the chicken and peppers you know and love in cheesesteaks. 1) Add the pasta and almond milk to the bottom of the Instant Pot. Then add the chicken, salt, pepper, garlic salt, bell pepper, and onion on top. Do NOT stir. 2) Close the lid and turn the pressure valve to sealing. Cook the pasta on high pressure for 4-5 minutes (1/2 the recommended cook time on the pasta box). Use a quick release for pressure after cooking. 3) Remove the lid and stir the pasta. The pasta should have absorbed most of the liquid. You will want to drain any liquid left. The amount is going to depend on how much liquid your chicken released. 4) Stir in the Greek yogurt. Once the pasta is coated in the yogurt, mix in the cheese until melted. Garnish and serve. 1) In a large skill combine all the ingredients except the yogurt and cheese. 2) Bring the pasta to a boil then cover and reduce the heat to medium low. Let the pasta simmer for 12-15 minutes, stirring occasionally. 3) When the pasta is done, drain and excess liquid if there is any. 4) Mix in the Greek yogurt until the pasta is coated, then stir in the cheese until it melted. Garnish and serve. 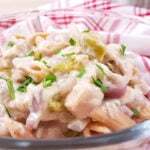 How do I make this Cheesesteak Pasta in the Crock Pot? 1) Add the pasta and almond milk to the slow cooker. Then add the chicken, salt, pepper, garlic salt, bell pepper, and onion on top. Do NOT stir. 2) Place the lid on the slow cooker and cook for 3-4 hours on high, 5-6 hours on low, or until the pasta and chicken are done. 3) Drain any excess liquid, then stir in the Greek yogurt until the pasta is coated. 4) Mix in the cheese until it is melted then garnish and serve. What is the original Philly Cheesesteak? Traditionally, a cheesesteak is a delicious and crusty roll stuffed with thin sliced and sautéed ribeye beef and onions. The cheesesteaks are not usually served with peppers, but it’s something that has been added over the years. For cheese, the authentic shops in Philly actually use canned Cheez Whiz. This healthy Philly Cheesesteak is made with a healthier meat and cheese, and the addition of peppers and onions. I’d highly recommend serving it with a side of vegetables since it’s a little light on those. 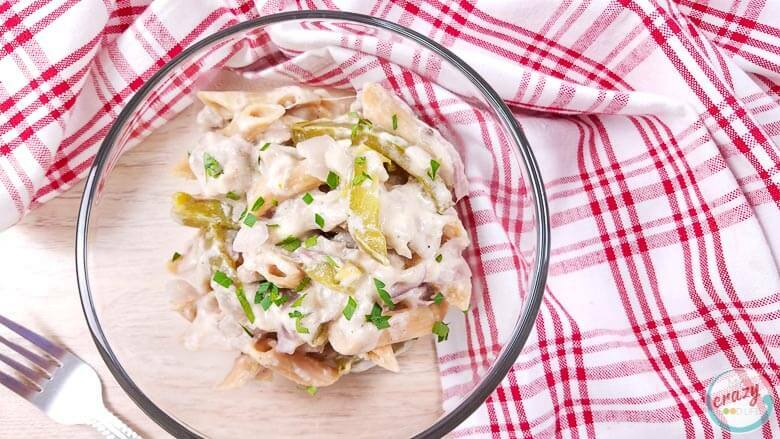 Which cheese does this Healthy Cheesesteak Pasta use? We’re skipping the Cheez Whiz for obvious reasons, friends! 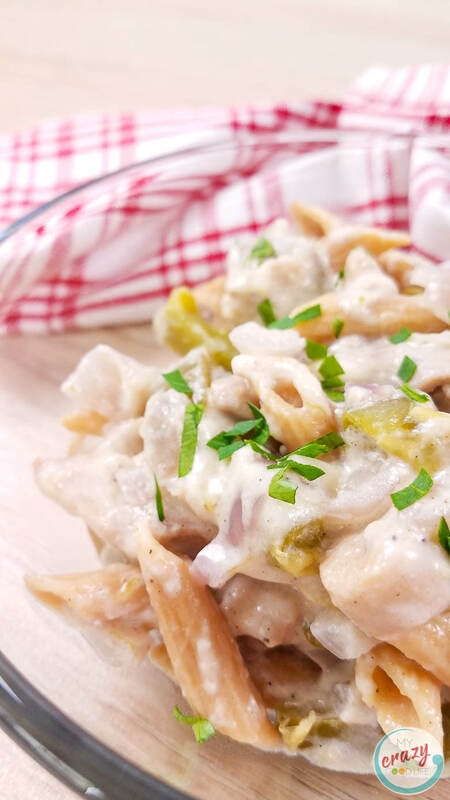 You’re not going to miss it entirely, though, because we are using mozzarella cheese along with greek yogurt to add a delicious cream base to this pasta recipe. Is this a good recipe for meal prep? I love that this hearty meal can be made one day and eaten throughout the week. It’s easy to freeze and keeps well in the fridge. I’d definitely consider this a healthy meal prep recipe. Is this 21 Day Fix Cheesesteak Pasta? It is totally Fix-approved. The counts for the entire recipe are 5 red containers, 2 green containers, 1 teaspoon (for the almond milk), 4 yellow containers, and 4 blue containers. Per 1 1/2 cup serving (there are 4 in this recipe), counts are 1 1/4 red, 1/2 green, 1/4 tsp, 1 yellow, and 1 blue. Is this Weight Watchers Cheesesteak Pasta? This is a Weight Watchers approved recipe! Each 1 1/2 cup serving is 6 freestyle smart points using reduced fat cheese and fat free greek yogurt with plain and unsweetened almond milk. Add the pasta and almond milk to the bottom of the Instant Pot. Then add the chicken, salt, pepper, garlic salt, bell pepper, and onion on top. Do NOT stir. Close the lid and turn the pressure valve to sealing. Cook the pasta on high pressure for 4-5 minutes (1/2 the recommended cook time on the pasta box). Use a quick release for the pressure after cooking. Remove the lid and stir the pasta. The pasta should have absorbed most of the liquid. You will want to drain any liquid left. The amount is going to depend on how much liquid your chicken released. Stir in the Greek yogurt. Once the pasta is coated in the yogurt, mix in the cheese until melted. Garnish and serve. In a large skill combine all the ingredients except the yogurt and cheese. Bring the pasta to a boil then cover and reduce the heat to medium low. Let the pasta simmer for 12-15 minutes, stirring occasionally. When the pasta is done, drain and excess liquid if there is any. Mix in the Greek yogurt until the pasta is coated then stir in the cheese until it melted. Garnish and serve. Add the pasta and almond milk to the slow cooker. Then add the chicken, salt, pepper, garlic salt, bell pepper, and onion on top. Do NOT stir. 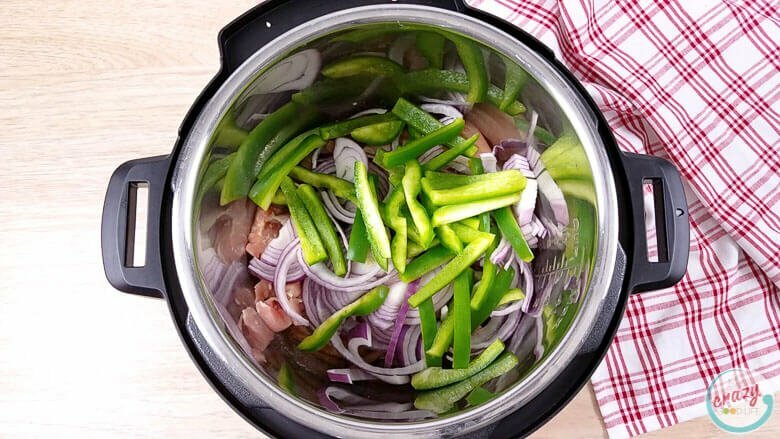 Place the lid on the slow cooker and cook for 3-4 hours on high, 5-6 hours on low, or until the pasta and chicken are done. Drain any excess liquid then stir in the Greek yogurt until the pasta is coated. Mix in the cheese until it is melted then garnish and serve. My whole family loved this when I made it last night! Already can’t wait to make it again! So delicious, I can hardly believe it’s a healthy recipe. Definitely a keeper! What a lovely pasta! The flavors in this dish sound delightful! Thank you! 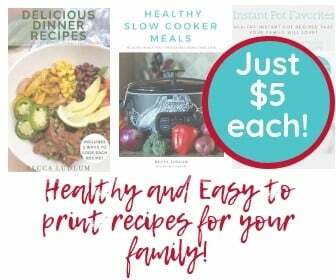 I’ve been wanting to try to make more dinners in my instant pot. Delicious! I had to use regular milk because my child is allergic to tree nuts. Then I kept gettin a burn message. I looked it up and it said not to use milk on the bottom because it burns to easy. Any advice?